Five months prior to his 18th birthday, Pte. Howard Cutler enlisted. He was assigned regimental No. 899. He left his home in St. George’s, N.L. 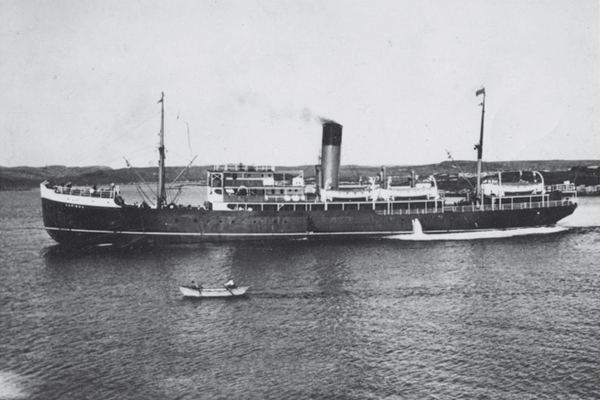 for St. John’s and embarked for England on March 20, 1915. After some additional training, Howard was sent to France and on July 1, 1916, participated in the Battle of Beaumont-Hamel. Despite suffering severe injuries to his chest and back, he survived, and eventually recovered. He rejoined the regiment and was wounded again, this time in the Battle of Cambrai in November 1917. After a period of convalescence in Rouen, France, he returned to his regiment once more and was discharged in April 1919. Howard narrowly escaped death on more than one occasion while fighting on the battlefields of France. Yet, only miles from his home, war surrounded him once more. Howard returned to St. George’s and for a period of time he resided with my grandmother, who was his first cousin. He later obtained a position with the Newfoundland Postal Service and was assigned as a mailman on the S.S. Caribou. In what many described as the most significant attack in Canadian waters during the Second World War, the S.S. Caribou was torpedoed and sunk by a German submarine in the early hours of Oct. 14, 1942, about 65 kilometers away from its destination of Port-aux- Basques. Howard, along with 136 other crew members and passengers, would perish that night. His body was never recovered. Howard narrowly escaped death on more than one occasion while fighting on the battlefields of France. Yet, only miles from his home, war surrounded him once more. The name Caribou and what it symbolized was a story he knew all too well, a ship emblematic of his old comrades-in-arms. Walter Swyer started his career as a teacher in St. George’s, N.L. He later became an engineer, joined the Canadian Navy, and travelled extensively. Along the way he received two more degrees, both from MIT, including a master of ocean engineering. He retired from the Navy with the rank of lieutenant-commander and then resumed his teaching career for another 16 years in St. George’s, where he now lives.